"We Keep on Doin' the Phonk" : It's what it means, a fat Funk track with heavy guitar. "Gotta Go 4 What U Got" more classical Funk in is construction, with scratchs. "U don't Ring my Bell" is more bluesy : it's not what I prefer but it's a good tune. They make fun of us and our cheese alright but I love it!!!! The groove is a killer! Wonder B a écrit : The New Grand Slam is ... slammin'! The immediate hit (for me!) is the Great 'WE KEEP ON DOING THE PHONK'! "...We keep on doin' the funk, no sell-out... for the funk of it... "
Another track that I am sure all French Funkateers will love is the ultra funky 'AMUSEZ VOUS BIEN'... the french lyrics are a riot... absolutely hilarious... and funnily they manage to make french sound really funky, when many bands in our own land are still looking to achieve that goal! Way too funky... the Germans are making fun of our eating habits but they do it with perfect taste...! 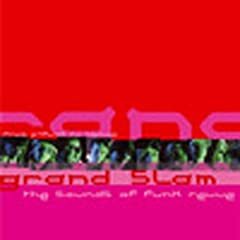 "Grand Slam kick a groove like a bullet from a gun... always fresh and always funky and always on the one... most of all we still love to FUNK!" I have to get this CD. Any recommendation from the FunkyGirl is high praise. Maybe one day I'll have the pleasure of meeting him and exchange some views and ideas about the music which we all love...! Modifié en dernier par Wonder B le 23/11/04 18:26, modifié 1 fois. Wonder B a écrit : Maybe one day I'll have the pleasure of meeting him and exchange some views about the music that we all love...! Yes, I would love to meet Wonder B too. I hear many great words about him as well. Much respect to you brother. Thanks for the kind words Joe!!! I'll be delighted to make your acquaintance...! Wonder B a écrit : Thanks for the kind words Joe!!! Just let us know next time you are in town and we can hook up and converse abour the funk. Unfortunately this is quite a short saty as I am leaving the newt day early in the afternoon... So I don't know where you'll be (especially after the New Year's Eve Party which I'll be missing because of this flight) but we could either meet on Saturday evening or Sunday morning... it all depends where you are geographically! They'll be in funkin Paris off their feet on May 24th! And do you know if there are other original members of Sly & Family Stone ? What about Cynthia Robinson ? It's really well mix of different style of grooves, P-Funk, Funk, Hip Hop, Ballads. It's really great and very mature in their mastering of music.